PT Riau Andalan Pulp & Paper, or RAPP, has initiated a new fire management program in the Pelalawan Regency of Riau Province, in cooperation with local government agencies that manage forest lands, enforce environmental protections, and deliver disaster response. 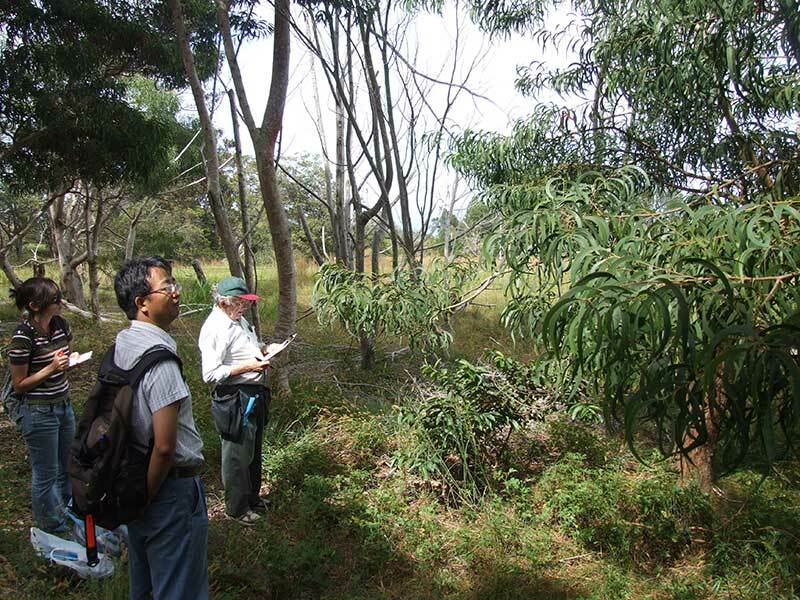 RAPP selected four villages to participate in a pilot program to curb forest and land fires. Through this “Fire Care Village” program, a village that managed to avoid fires completely from July to September would be awarded a special bonus of 100 million Indonesian rupiah in assistance, the equivalent of more than $8,000 USD. Villages in which fires affected less than 1 hectare of land, and in which residents controlled the blaze within 24 hours, would receive 50 million rupiah. RAPP, a subsidiary of APRIL (Asia Pacific Resources International Limited), is among the constituent companies of the RGE Group, the $15 billion corporation established by Indonesian entrepreneur Sukanto Tanoto. As such, RAPP takes its responsibilities as a corporate citizen seriously. Following Mr. Tanoto’s business philosophy based on keeping the needs of company, community, and the planet equally in mind, the APRIL concessions in Riau practice a zero-burn policy and strive to maintain compliance with all applicable regulations and environmental best practices. Innovating to find new ways of crisis management (in this way is forest fire) is also part of the important criteria of a successful entrepreneur. RAPP’s Fire Care Village program came in response to extensive forest and land fires that occurred in Riau in the spring of 2014. The situation became so dire that the Indonesian government declared a state of emergency. RAPP executives noted local village residents might need added incentives to take an active role in fire management. International environmental organizations viewed the spring fires with concern. One group listed more than 3,000 verified fire alerts on Sumatra for the period from late February to mid-March. June through September is typically Indonesia’s dry season, and the country saw very few fires during the early spring of 2013. The spring 2014 figures are far higher than those during a June 2013 fire and haze crisis on the island. Experts believe that unusual drought conditions in Sumatra in the early part of 2014 contributed to the problem, with the majority of the fires occurring in Riau. Environmental organizations admit difficulties in gathering accurate data on exactly which concession boundaries any particular fire has affected. The situation is a complex one, and the solutions will require better communication between government agencies and companies, as well as better monitoring systems on the ground. RAPP continues to look for ways to take a leading role in fighting this shared problem. 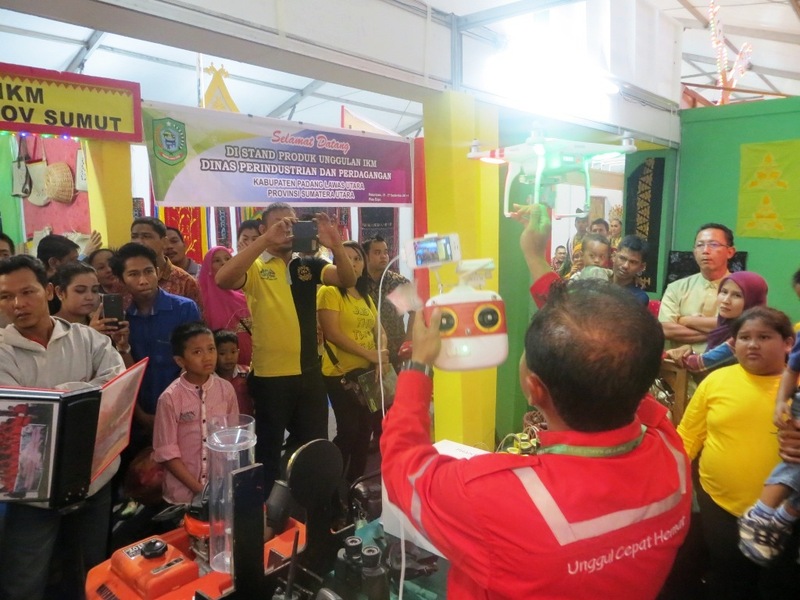 At the 2014 Riau Expo trade and industry show, representatives of Riau Andalan Pulp & Paper demonstrated a safety-focused innovation. True entrepreneurship never runs away from constant innovation. RAPP always strive to innovate to create better products or processes that benefit the community, the country and the company. Riau Andalan Pulp & Paper (RAPP), part of APRIL, or Asia Pacific Resources International Limited, recently participated with a demonstration booth at the Riau Expo 2014. RAPP and APRIL, part of the $15 billion RGE Group under the direction of founder and CEO Sukanto Tanoto, are among Indonesia’s most well-known natural resources manufacturing companies. At the expo, RAPP representatives demonstrated the capabilities of the quadricopter, a new remote-controlled, helicopter-like aircraft that the company aims to use to monitor remote plantation lands. This is an especially important mission in the more isolated parts of Riau, where fires can break out and spread if unchecked, increasing haze conditions in the broader region. RAPP and APRIL have made significant progress in addressing safety concerns from environmental groups and local communities through their careful monitoring of fires and haze formation throughout their concessions. RAPP organizers also provided information to visiting high school students and other expo attendees about its other recent initiatives, its community involvement programs, and current trends in the wood pulp and paper industries. The Riau Expo, an annual event held in the provincial capital of Pekanbaru, promotes trade, tourism, and industry throughout the province, and also showcases the arts and cultural expressions of the people of Riau. This year, every available booth space was purchased, making the event a rich display of local knowledge and entrepreneurship. The networking opportunities at the expo additionally served to further new business connections and innovations. 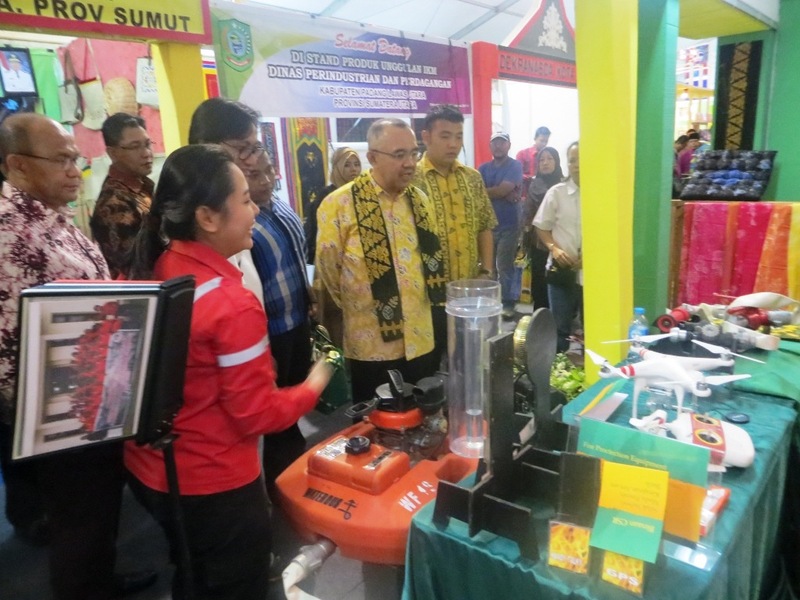 Deputy provincial governor H. Arsyadjuliandi Rahman officially opened the expo, which took place from September 21st to 27th and commemorated the 57th anniversary of the creation of Riau Province. Organizers invited not only companies from the private sector, but provincial, district, and city government agencies to participate. According to Energy Information Administration (EIA), China is attempting to use more natural gas to reduce air pollution and carbon dioxide emissions, which are largely caused by coal and oil usage for energy. Underpinned by large investments in domestic gas production and infrastructure, along with growing imports, the Chinese government anticipates increasing its gas share of total energy consumption to around 8% by year end 2015 and to 10% by 2020. In 2012, natural gas accounted for only 4.9% of China’s total energy consumption. In fact, besides China, it has become a global awareness to support the consumption and production of clean energy in order to ensure sustainability of resources. New entrepreneurs these days are also looking into clean energy innovations or coming up with business ideas that do good for the environment and profitable at the same time. Woodfibre LNG, a subsidiary of Pacific Oil & Gas, which is in turn part of the RGE Group of companies headed by Sukanto Tanoto, has recently signed an agreement with Chinese province of Guangdong, to support their demand for LNG for the next 25 years. 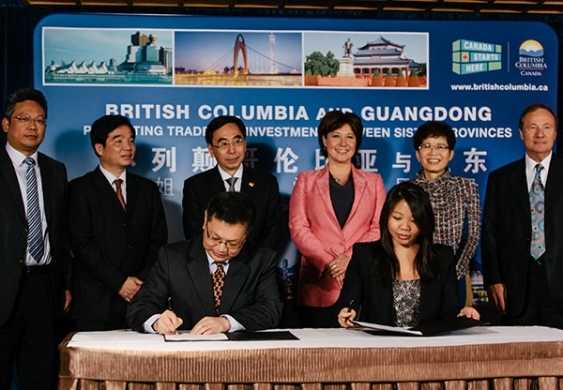 Near the end of September 2014, the Chinese province of Guangdong announced the opening of a trade office in Vancouver, Canada, that will serve as the first of its kind in that country. This move also coincides with the signing of a preliminary offtake agreement between Guangzhou Gas Group Co Ltd and Woodfibre LNG, a Singapore-based firm that plans to export liquefied natural gas from western Canada. Guangzhou is the capital and largest city in Guangdong Province. Guangzhou Gas Group Co. Ltd. and Woodfibre LNG have signed a memorandum of understanding (MOU), outlining a long-term stable supply of natural gas to meet Guangzhou City’s gas demands starting in 2017 (targeted date). British Columbia’s premier, Christy Clark (2nd row, 3rd from right), has supported both the increased Chinese trade presence in her province and her government’s developing relationship with Woodfibre. The Woodfibre-Guangzhou agreement highlights the growing strength of the Tanotos’ plans to establish an LNG export hub in the town of Squamish, near Vancouver. The Woodfibre agreement with Guangzhou will cover close to one-half of the Singapore company’s planned yearly output of liquefied natural gas. The terms state that Woodfibre, currently working with the goal of starting operations in 2017, will provide Guangzhou with 1 million tonnes of natural gas per year for 25 years. China is the world’s third-largest importer of natural gas, and its urban areas along the coast account for much of its demand Click here for more information. Woodfibre’s planned site, at the location of a defunct pulp mill, has optimal access to existing infrastructure such as industrial zoning, a deep-water port, a gas pipeline, and a functioning power grid. Company executives also point to the environmental benefits of the construction of a FortisBC gas pipeline partly through a pre-existing route. Clark, in turn, has extolled the LNG industry’s capacity to create new jobs in the province and Woodfibre estimates that its project in Squamish will create 500 jobs in construction and 100 full-time staff positions. As a successful entrepreneur owning large corporations, it is important to receive certifications from trustworthy third parties to ensure your credibility in quality and practices. It may not be an easy or fast process but it is a required step to ensure your accountability to the stakeholders. Asian Agri, one of the natural resources production companies under the direction of the RGE Group and its founder, Indonesian businessman Sukanto Tanoto, operates with a production capacity of 1 million tons of palm oil annually. Asian Agri, which is among the world’s largest manufacturers in its market sector, has committed its efforts to sourcing only legally obtained palm oil product. The company has recently placed an emphasis on requiring legal certification regarding the provenance of all freshly harvest fruit product from each third-party supplier and wholly independent farmer with whom it conducts transactions. As part of its partnership with the local communities with whom it does business, Asian Agri has provided close to 29,000 smallholder families who farm its lands on Sumatra with a wide range of social and economic benefits. Of the company’s 160,000 hectares of total land area, some 60,000 are developed in cooperation with smallholding families who participate in its Plasma/KKPA programs. Mr. Tanoto remains highly engaged with the day-to-day operations of his companies and has charged each of them with maintaining a high level of transparency and responsiveness to their smallholders and to the public. Asian Agri has stepped up its focus on environmental good stewardship through increased attention to the problem of illegal palm oil entering the market. Through stringent attention to documenting that the produce it acquires is completely legal, the company hopes to build increased sustainability into the supply chain. Asian Agri also advocates for the closure of illegal palm oil plantations and for added efforts to protect forest land in the regions where it operates. 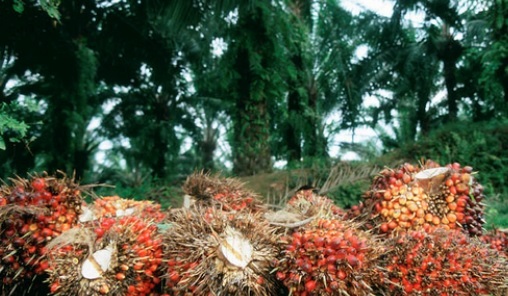 Illegal palm oil production and sales in Indonesia have created an economic system that will not be easy to eradicate. Several non-governmental organizations have expressed concern about the fact that some illegal palm oil continues to seep into the products of a number of high-profile manufacturers. Yet Asian Agri and several of its fellow palm oil producers plan to dedicate continued efforts to prevent deforestation, illicit land use, and environmental degradation.